The United States Capitol, located on top of Capitol Hill at the east end of the National Mall, serves as the seat of government for the United States Congress, the legislative branch of the U.S. federal government. Designed by a succession of architects, the neoclassical building is marked by its dome above a rotunda and two wings, one for each chamber of Congress: the north wing is the Senate chamber and the south wing is the House of Representatives chamber. With but one brief interruption, the Capitol has housed the legislative chambers of the U.S. Congress since 1800, and housed the U.S. Supreme Court from 1800 until 1935. Presidential inaugurations are traditionally held here, the physical symbol of the United States of America. When Pierre Charles L'Enfant planned the city, he chose Jenkins Hill, which rose 88 feet above the Potomac River, as the site for the new Capitol Building. The following year, a public design competition was held and amateur architect, William Thornton, inspired by the east front of the Louvre and the Roman Pantheon, was selected by Thomas Jefferson and George Washington. Execution was entrusted to Étienne Sulpice (Stephen) Hallet, a runner up in the competition, under the supervision of James Hoban. The cornerstone was laid by Washington on September 18, 1793. In 1795, Jefferson, vocal in his preference for Thornton's classical design, dismissed Hallet and George Hadfield was hired as superintendent of construction, only to resign three years later. In 1803, Benjamin Latrobe replaced him as Architect of the Capitoland, against his protestations, saw Thornton's design to near fruition. The Capitol held its first session of United States Congress on November 17, 1800 in a then unfinished building. The Senate wing was completed that year, and the House of Representative wing was completed in 1811. In August 1814, the Capitol was partially burned by the British during the War of 1812. Reconstruction began under Latrobe, who was given more latitude to make alterations, in 1815 completed by 1819. Under Charles Bulfinch, who took over as Architect of the Capitol in 1918, construction continued through to 1826, with the addition of the center Rotunda area and the first dome of the Capitol. The building was expanded dramatically in the 1850's under Thomas U. Walter, who was responsible for the wing extensions and the new "wedding cake" cast-iron dome, three times the height of the original dome and 100 feet (30 m) in diameter, which had to be supported on the existing masonry piers. The double dome consists of a large oculus in the inner dome, through which is seen The Apotheosis of Washington painted on a shell suspended from the supporting ribs, which also support the visible exterior structure and the tholos that supports the Freedom, a colossal statue that was added to the top of the dome in 1863. The weight of the cast-iron for the dome has been published as 8,909,200 pounds. When the dome was finally completed, it was significantly larger than the original plan, and its massive visual weight overpowered the proportions of the columns of the East Portico. The East Front was rebuilt in 1904, following a design of Carrère and Hastings. A marble duplicate of the sandstone East Front was built 33.5 feet from the old Front during 1958-1962, and a connecting extension incorporated what formerly was an outside wall as an inside wall. In the process, the Corinthian columns were removed, and landscape designer Russell Page created a suitable setting for them in a large meadow at the National Arboretum, where they are combined with a reflecting'>reflecting pool. The current Capitol Grounds, cover approximately 274 acres, were designed by Frederick Law Olmsted, who planned the expansion and landscaping performed from 1874 to 1892. In 1875, as one of his first recommendations, Olmsted proposed the construction of the marble terraces on the north, west, and south sides of the building that exist today. 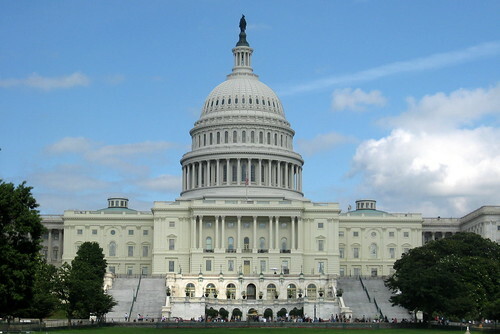 In 2007, the U.S. Capitol was ranked #6 on the AIA 150 America's Favorite Architecture list.